Now with a Wireless Remote Control! With 16 carbide-tipped teeth, this model is just right for wide or extra long driveways, large parking lots, private roads, horse arenas and more. Weighing 15 pounds more than our 48" model, this model also has the extra heft to quickly penetrate especially hardpacked surfaces. 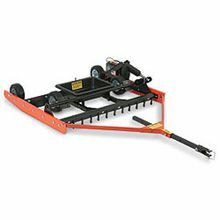 The carbide-tipped steel scarifying teeth loosen the hardest, most compacted materials, removing high spots and washboard. The rear leveling blade spreads loosened material, filling in potholes, ruts, and washouts. The result is a smooth driveway that's easier to drive on and easier on your car or truck.